If you don't floss your teeth you are not cleaning 30% of your mouth. The team have been busy reminding the community about the overall health benefits of flossing their teeth, through the sales of Fairy Floss. The idea is encourage people to remember that flossing is just as important as brushing your teeth! The surfaces between our teeth -where they touch, is the most common area where tooth decay starts. 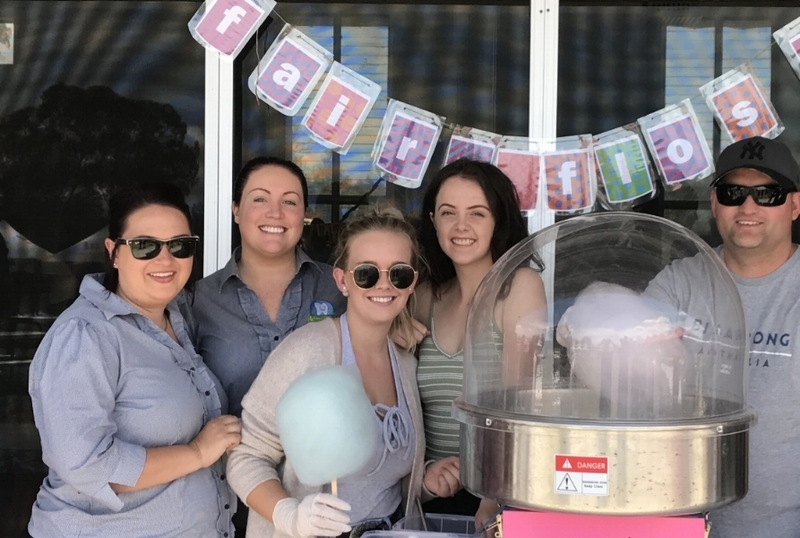 At each fete we sold Fairy Floss to customers, they also received a bag of goodies which contained; a toothbrush, toothpaste, Oral Health Information and most importantly Dental FLOSS! All funds raised by the sale of the Fairy Floss were donated to the Schools. We would like to thank St James Primary School and Muswellbrook South Public School for inviting us out to their fetes on 22 October and 3 November. Do you have an event coming up, would you like The Happy Tooth to come along? Call us today on (02)6541 1111. Helper Brad with team members Katrina and Samantha.